A black racist (Liberal, of course!) has published his rules for racists. And black Liberals certainly should know, as they are the most vile racists of all, including their racist white counterparts: the meddling, bourgeois, cocktail sipping white apologist crowd. 1. 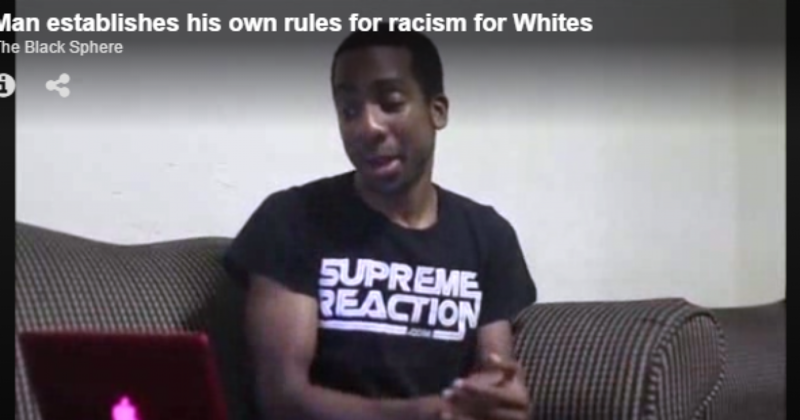 When black People talk about racism, white people need to just listen. White people aren’t allowed to talk about racism. So shut up; unless you are apologizing for your ancestors, and your white privilege. 2. Quite being offended when black people talk about racism, in the context of white supremacy. In other words, white people are all racists. Don’t act like white supremacy doesn’t include you, because you’re white! So what you grew up as an orphan, and had to work your way through community college. You’re white, and therefore a racist! Racism is everywhere! You just have to learn how to spot it. Clouds; white. Paper; mostly white. Egg…WHITES! YOU SEE! 4. Blacks don’t have the power to be a racist. So what Obama is president; he has no power. He’s has been kept down by the white man. Can’t you see this?! 5. Just because black people generalize about whites and racism, does not make the black person a racist. Only white people generalizing about blacks is racist. Don’t get it twisted! 6. One reason we have a race problem is because white people have a hard time dealing with and admitting that we do have a race problem. If you will only agree with black racist about the racism issue this terror would all end for you white people. 7. Black lives do matter. And don’t come in and say all lives matter. Black lives matter more, because of the years of oppression by whites. Don’t you see that? Or are you racist enough to care about all people over black people?